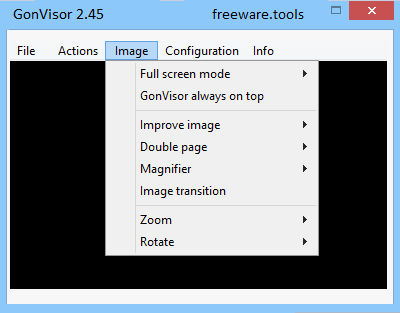 GonVisor is an image viewer specially developed to be used as CBR and CBZ file viewer. Those formats are the ones commonly used for comics., magazines and e-books. You can load CBR and CBZ files, but you can also view other common files, such as JPG, BMP, PNG, TIFF or GIF. You can load full folders, so you can use it as a perfect image viewer. GonVisor makes easy to browse your images. Choose the one you can view, zoom in and out, ove around it and focus on special details. You'll find a side menu with many buttons and options. Save bookmarks, copy files, export them, a good image viewer specially thought for comic lovers. GonVisor is an application that lets you view image files and documents. It supports JPGs, PNGs, TIFs, BMPs, PDFs and other formats. Installing this program shouldn't be very difficult. Just keep in mind that GonVisor offers to download and install some third-party components that it doesn't need in order to work properly, as well as to make some changes to your web browsers. The interface of the tool is plain and simple. You can import a file by using the file browser or the "drag and drop" method. So, you can open an image, a list or a folder with images, open folders recursively, open images from a PDF document, create CBRs or CBZs with images loaded, extract images from a folder, and more. Furthermore, you can go to the next or previous image, enable an automatic slideshow, switch to full screen mode, view image previews and enable double-page view. Additionally, you can zoom in and out, use a magnifier, automatically improve colors, set the image transition, rotate the picture, as well as fit its width and height. Moreover, you can change the interface language, main screen style and backcolor, manage the control bar, use keyboard shortcuts, configure the mouse buttons, set file associations, and others. The tool takes up a very low amount of system resources and didn't cause us any issues during our tests. Although there is no help file available, GonVisor can be easily used, even by beginners.